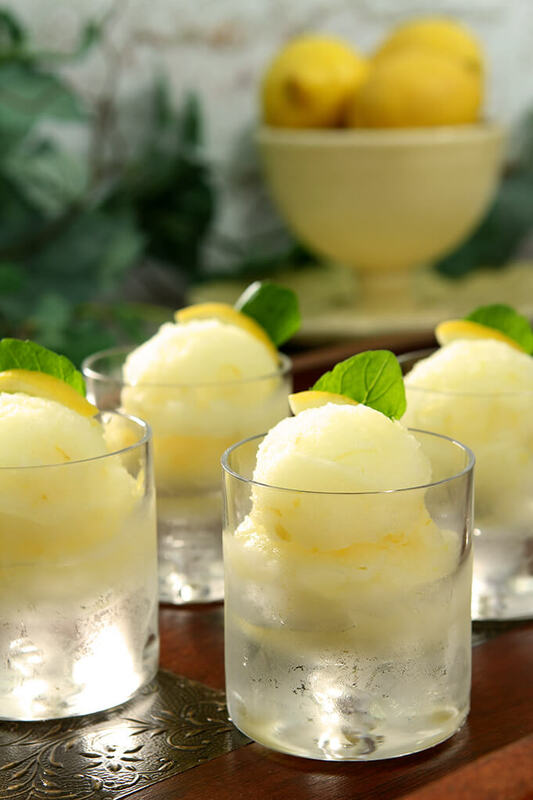 Limoncello Sorbet is light and lemony and simply lovely! Originally made as a palate cleanser for a holiday Feast of the Seven Fishes; it’s really perfect in spring and summer too when you crave a refreshing, cold libation. When I first published this post about Limoncello Sorbet it was in conjunction with a holiday event called the Feast of the Seven Fishes; a part of the Italian-American Christmas Eve celebration. Even then it was a stretch culturally because while I love Italian food; I’m more like a Heinz 57 pup; mostly German but with some English and Irish thrown into the mix. Sure in my heart I’m Italian and it’s the cuisine that really got me excited about cooking even if what I thought was wonderful Italian food was a bit less than the real deal as I’ve come to learn over the years. Still; it’s food that I love and I just know that the first time I step foot on Italian soil that I will never want to return. The land, the wine, the outgoing people…we would all work out very well together, I just know it. That I love Limoncello with a passion too? Well here’s proof in this light and lovely Limoncello Sorbet which we served as the palate cleanser for our feast. So while I can find a way to make my appropriation of a very Italian holiday work for a blog post, the truth is I always sort of hated that this amazing little treat, so perfect for summer, was buried deep in a winter post. SO wrong! Today was the day to rectify that wrong. I’m working on updating a lot of older posts and even some newer ones; in this case it was the latter as I was working on creating new images for Pinterest. But I also was dying to have some of this fabulous sorbet…and it hit me that you might love it too and certainly be more inclined to make it mid summer than mid winter! I fell head over heals in love with Limoncello on a trip to Boston almost 15 years ago and the love has never waned. I’ve even made my own the past couple of years…you should try that too! 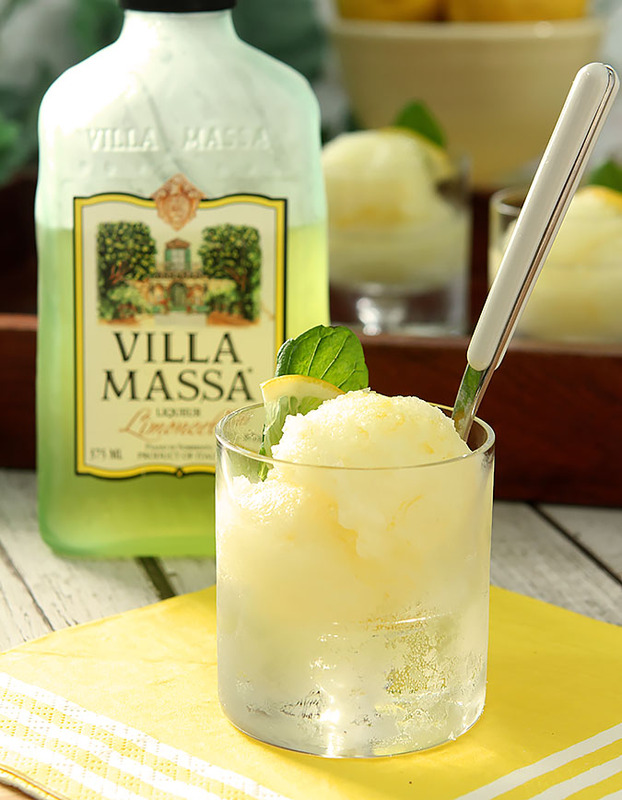 Sadly I am out of my homemade but I love Villa Massa so I’ve got a batch in the freezer that I made the other day…tomorrow after another weekend of yard work will be my reward. While summer is the time for all things ice cream and some will be the goopiest most over the top creations EVER (yes, I do that too! 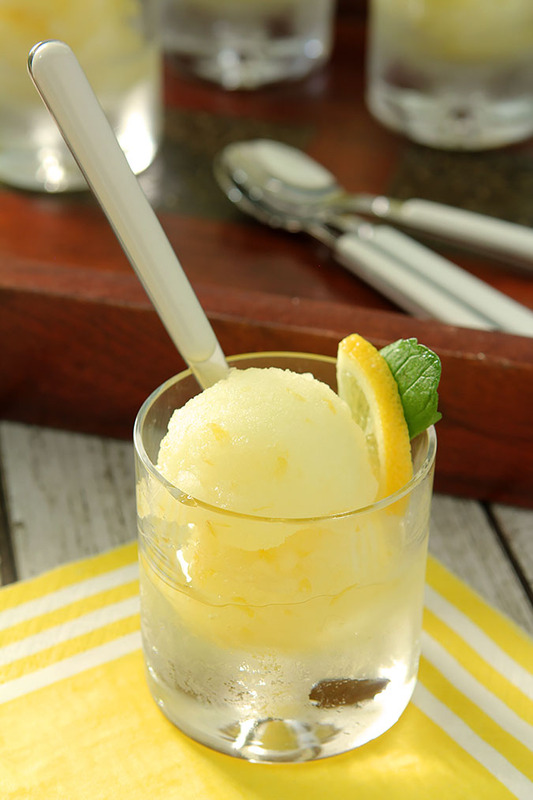 ), you should make time for both this and my lime sherbet recipe; they are so perfect after a big meal on the grill while sitting outside on the patio relaxing with family or friends. Close your eyes and you just might be transported to Italy too…Salute! In a saucepan, combine the sugar and 2 cups water. Bring to a boil over medium-high heat, stirring occasionally until the sugar is completely dissolved and a syrup has formed, about 5 minutes. Let the syrup cool to room temperature. Pour the syrup into a bowl and stir in the lemon zest and juice, salt and Limoncello. Cover and refrigerate until very cold, at least 2 hours or up to 1 day. Pour the cold lemon mixture into an ice cream maker and churn according to the manufacturer’s instructions. Cover tightly and freeze until firm, at least 2 hours or up to 3 days. This took longer than ice cream to freeze up due to the amount of alcohol in the mix. Be patient, it will get there! Mine never turned to Sorbet. I left it going in my kitchensid icecream maker for 4 hours 🙁 I have no idea what could have gone wrong. I’ve made it numerous times with success Cheryl so I wish I could pinpoint what it could be; especially since there are so few ingredients. The ONLY thing I can imagine is that your Limoncello was higher proof than mine? Because it has alcohol which prohibits freezing that might have been the cause? If you still have it; add a bit more of the other ingredients and see if that will let it set up. Good luck! Oh my, what a thirst quencher! It is amazing Amy; something I think I’ll have on hand a lot now that I’ve tried it! Oooh…perfect; let me know if you make it. Tangelocello sounds so good too! Well at least my parents suffered with us; and suffer it was although I do love the fish sandwich at McDonald’s…go figure huh? Yes, next time be sure to make some sorbet too Liz; it’s wonderful! Beautiful! Perfect palate cleanser and you know I’m always up for limoncello or a cocktail. 🙂 Happy holidays! 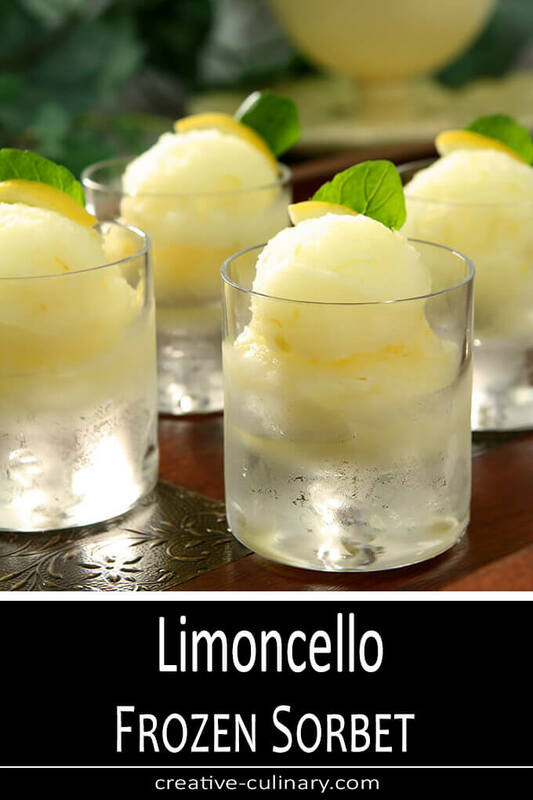 Limoncellos sorbet sounds like the most delicious way to end a meal. I too, love Limoncello! This sorbet would be one of my favorite things on the menu! A nice refreshing treat anytime of the year! I think it’s a perfect addition to the traditional Feast of the Seven Fishes! I’d happily eat yout limoncello sorbet as my palate cleanser between each and every seafood course too. I’ve never been able to eat fish. I started tossing it all back up as a child and as every good Catholic family, there was always fish on Friday. I was thrilled when my mother was ‘given permission’ to give me something else to eat on Fridays. I’ve always said one of those Scandinavian relatives made a quick trip to Italy and well, infused the family with some secret Italian blood. 🙂 Loved participating…thanks!